MAX Bushnell and Bianca Jackson sit with an empty hat begging for help. They are the hard-luck face of the street in 2017, as support agencies like the St Vincent de Paul Society are bracing for a tough year ahead. Young people make up an increasing number of people turning to agencies for support. 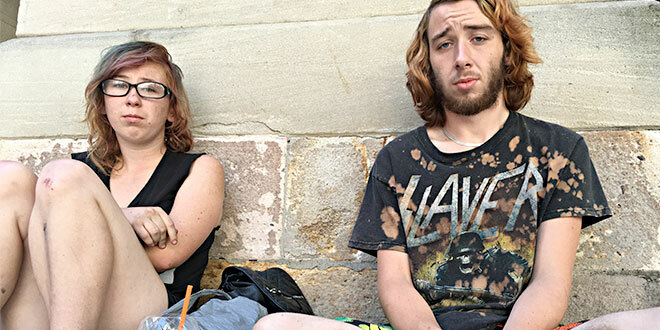 Last Monday night Mr Bushnell and Ms Jackson, both 17, tried to sleep in Brisbane’s Queen Street Mall, moved on to a nearby park, until the sprinklers went off, and ended up sheltering at a bus stop. “We only got about 10 minutes’ sleep I reckon,” Mr Bushnell, originally from Sydney, and unsure of where to look for help in Brisbane, said. Ms Jackson, who has lived on the streets since she was 14, said she encountered a night of fear. “There are predators about. They are on drugs and they looked so hard at us,” she said. Both teenagers say they were kicked out of home. Together they crave enough money for a hot meal and maybe a hotel room if they are lucky. They are pleased to hear that Vinnies may be able to lend support. Whether because of desperate family circumstances or rising costs of living, many thousands in Queensland are expected to turn to Vinnies for support this year. It’s part of a snapshot of growing poverty, which has seen one in six Australians struggling, or unable to put food on the table. “Disturbingly, the sheer volume of people needing our help is steadily rising, and in 2016 we had thousands more people turning to us,” St Vincent de Paul Society Queensland state president John Forrest said. 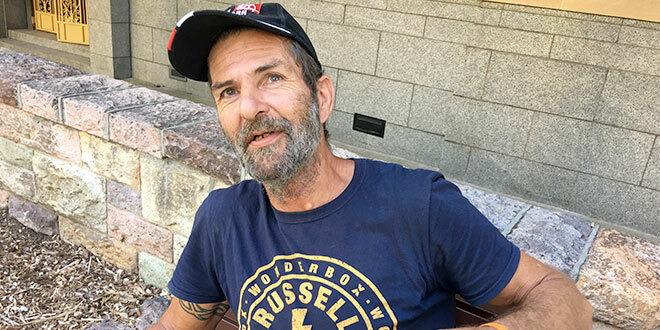 Rob McGaughy, 54, was drinking his morning coffee on a bench in Brisbane’s Anzac Square last week. On Monday night he rolled out his swag at a nearby bus shelter. “I see a lot of people on the streets who are receiving some government money through Newstart, but it’s not enough to live, or find accommodation, let alone support a family,” Mr McGaughy, who finds some work as a bore-runner on a northern cattle station, said. Rob McGaughy: “I’ve learnt to survive, to roll with the punches instead of saying poor me”. Now it’s the wet season and he’s living rough in the city. “How the hell can you feed and clothe a wife and a few kids?” he said. Mr McGaughy said he was an “old hand” at living on the streets. He said he had seen a huge increase in numbers, especially young people forced to sleep rough. “I’ve learnt to survive, to roll with the punches instead of saying poor me. I get off my backside and look for work,” he said. “But you need money to survive and a lot of times I haven’t had that, and so I have relied on charities and church groups. Across Australia, a largely hidden mass of people have done it tough during the past 12 months. According to the Foodbank Hunger Report 2016, one in six Australians will have struggled, or been unable to put food on the table at some point. In an average month about 644,000 people received food relief of some form, a third of them children. Alarmingly, 43,000 are turned away every month as charities struggle to meet the growing demand. The charitable work of Vinnies supports more than 260,000 people across Queensland each year. Mr Forrest said Vinnies had been heartened by the response to the Vinnies 2016 Christmas appeal, and said it showed that Queenslanders had generous and compassionate hearts. Christmas was made brighter for thousands of families doing it tough, thanks to the generosity of Queenslanders contributing to appeal. Mr Forrest said the appeal had raised $440,000 to date, along with thousands of kilograms of material goods in the form of Christmas hampers, food, linen, clothing and toys. “I’d like to extend my thanks to everyone who has already given so generously,” Mr Forrest said. “Although this is a great result, we haven’t yet met our goal for the appeal. People still have the opportunity to give to the appeal so we can help as many people in need as possible. “For people struggling to put food on the table, keep a roof over their heads and keep the electricity on, every little bit of help really can make a difference. “The spirit of giving is well and truly alive across our state, and the response we’ve had has been most reassuring. It is not too late to support the Christmas Appeal, which contributes a large chunk of the funds Vinnies need to meet demand throughout the year, and they’re urging the community to dig deep. “A small act of generosity can be life-changing for a family. Nobody wants to feel they can’t give their kids a good start to the year,” Mr Forrest said. To make a donation phone 13 18 12 or visit the Vinnies Christmas Appeal website.